The Isle of Man TT Marshals Association is appealing to visitors to this year’s Festival of Motorcycling, as well as local residents, to marshal at the Classic TT Races and Manx Grand Prix. On-line sign up is available on the TT Marshals’ Association website at iomttma.com and click the on-line sign up link. The organisation also currently operates a ‘hard copy’ paper system and forms can be collected and returned to the marshals office behind the Grandstand. 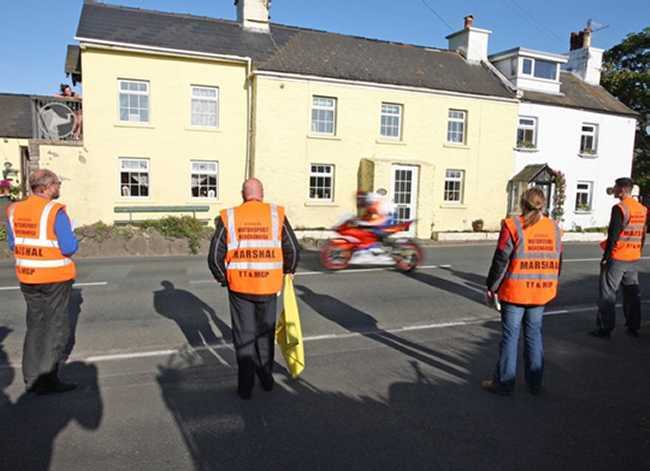 Marshalling at the TT Races is open to anyone over the age of 16 years old. The organisation welcomes newcomers to marshalling and shows a short introductory DVD for novice marshals at the office. There is also a link on the website where it can be viewed on YouTube. The opportunity is available for newcomers, once they have completed three sessions, to go on a detailed incident management course, free of charge, which includes a basic first aid session. Online signing on is now open for people who are available to marshal at any or all of the two weeks of qualifying and racing and the IOMTTMA officials are encouraging people to sign up as soon as possible so they have an idea of likely manning levels and can plan accordingly. He also appealed to people who have previously registered to let them know specifically if they were not available to marshal as this also helps to establish accurate numbers. The TTMA now operates a new display system in the marshals’ office behind the grandstand, which shows at a glance which areas are fully covered around the course and which need additional people.